← I shouldn’t have added the Shiitakes…. I had a Sunday School teacher who once described my style as ‘Cooking by the seat of my pants.’ By this she meant that I kinda make things up as I go along. A pinch of this, a dash of that… until everything tastes good. I spent all morning dreaming about the vegetables I was gonna roast for tonight’s dinner. 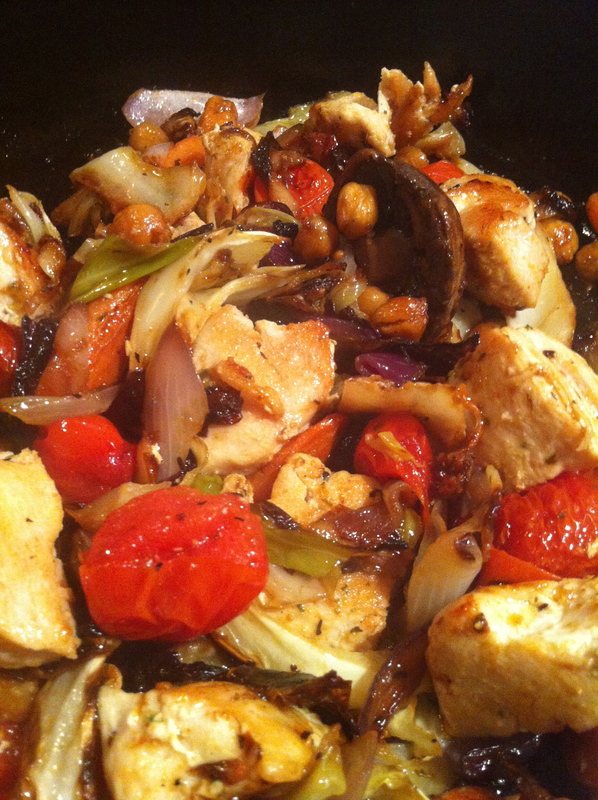 Carrots – no baby carrots, cabbage, cherry tomatoes, button cremini mushrooms, red onions…maybe even some garbanzo beans too! This afternoon I roasted a whole bunch of yummy delicious vegetables and about 30 minutes before dinnertime I realized I hadn’t even made the chicken yet! Actually, I hadn’t even taken it outta the freezer. *sigh* Totally forgot. Oh, and have I mentioned that I don’t speak microwave? I mostly figured out how to defrost two boneless, skinless chicken breasts in the thing. Then I sliced the breasts into 1″ thick planks, then cut those in half. Made about 8 cubes/breast. I heated up the cast iron skillet, then added some olive oil. When that got hot I tossed in the chicken and sprinkled with some Montreal Chicken seasoning. About 3 minutes later I turned the pieces so other sides would brown too. 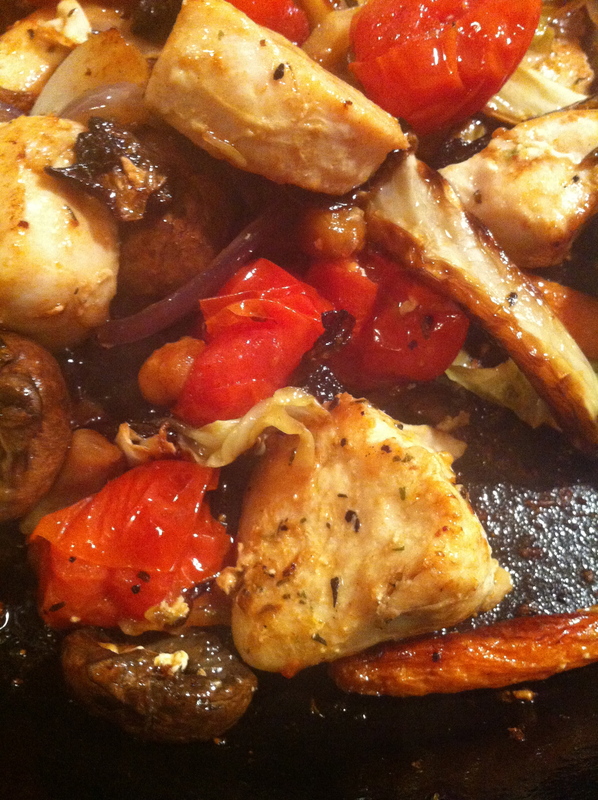 I thought the chicken could be a little browner, so I added in just a touch more oil. 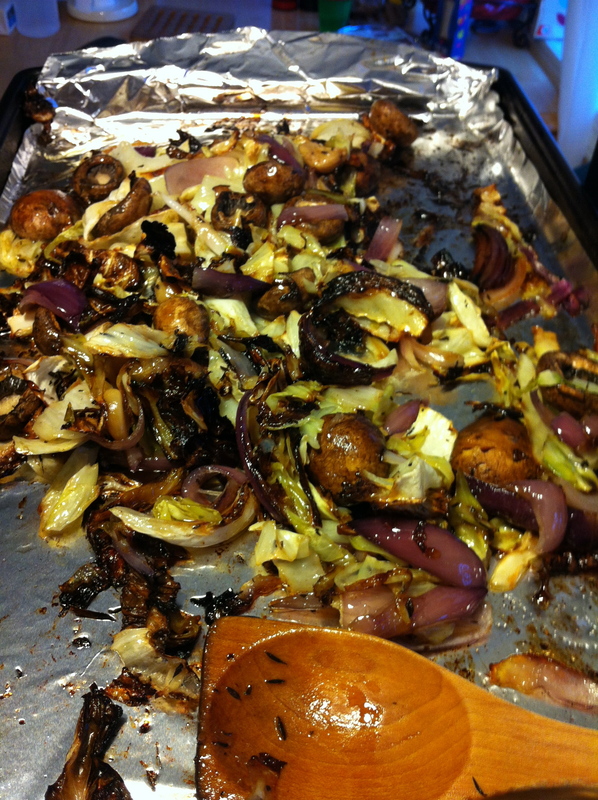 When the chicken was done, I shoved it off to the side and tossed in a big fat pile of roasted veg. I tossed everything together and tried not to clap with joy. This was a very good dinner. I think a cast iron skillet helps make everything just taste better. 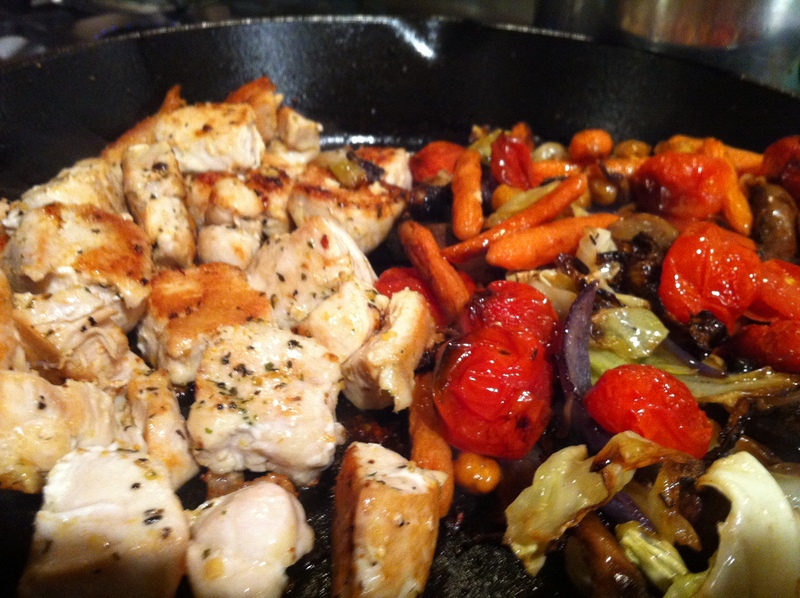 1- Start heating an empty cast iron skillet on the stovetop over medium-high heat. 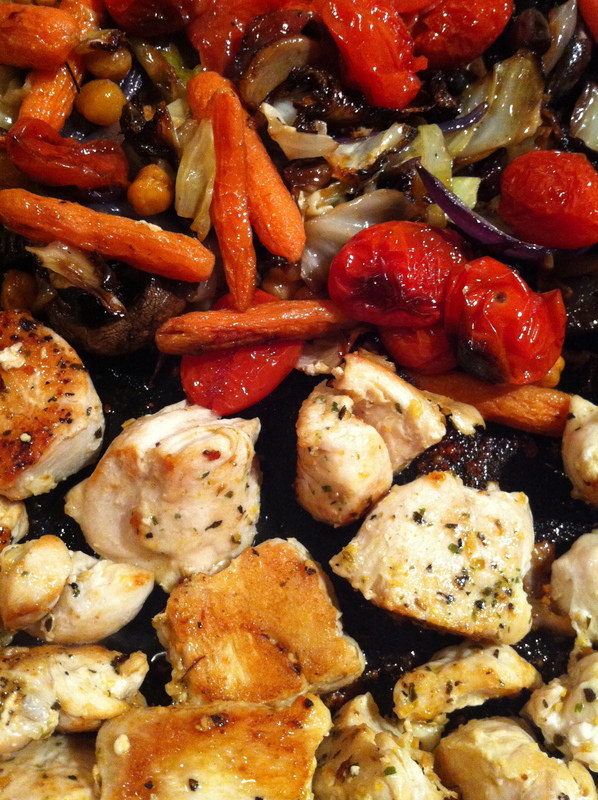 2- Slice your chicken breasts into 1″ planks (about 4/breast) and then slice those planks in half. 3- Add 1 Tablespoon or so of olive to your skillet. When it’s hot, add in your cubed chicken – don’t stir it. Let it set and get all crispy. After a minute or so sprinkle 1 teaspoon of your chicken seasoning over the pieces. 4- After 3-4 minutes start turning your chicken pieces so all sides can get browned and delicious. After you’ve turned the pieces at least once, sprinkle on the second teaspoon of seasoning. If your chicken needs a little help browning, feel free to drizzle on 1 more teaspoon of oil. My pieces took about 10 minutes total to cook through – I tasted the thickest piece to ensure everything was done. 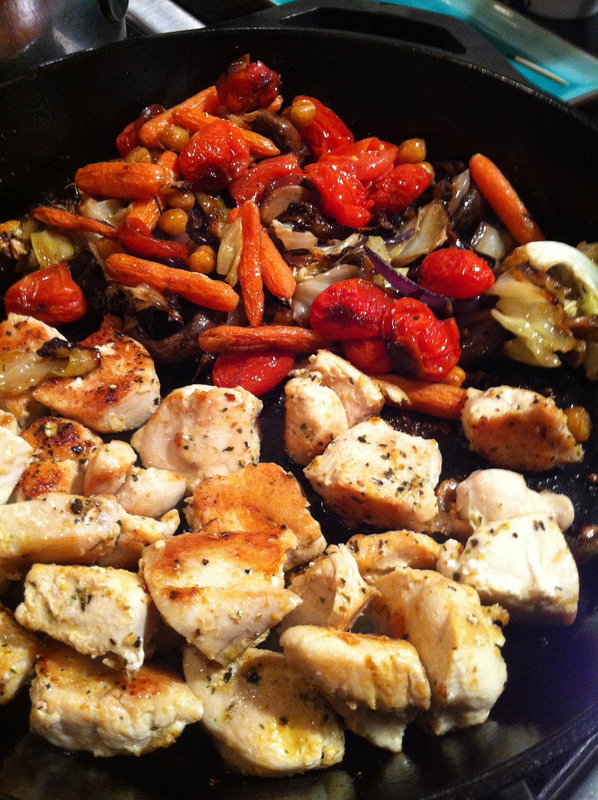 5(optional) – If you’re reheating veg in the skillet, this is where you’ll shove your chicken to one side of the pan, lower the heat to medium, and scrape/dump in the stuff that needs heating up. Stir a few times and then, voila! Dinner is served! Using foil helps with the clean up. 1- Oven to 425ºF. Line 2 or 3 baking sheets with foil. 2- Lay your veg on the pans. Drizzle with 1 Tablespoon of oil per pan. Either use your hands or a spoon to stir the veg around, get them coated with oil. 3- Whack your pans into the oven. 10 minutes later, spin your pans to ensure even browning. 4- Every 10 minutes come back and shake the pans. 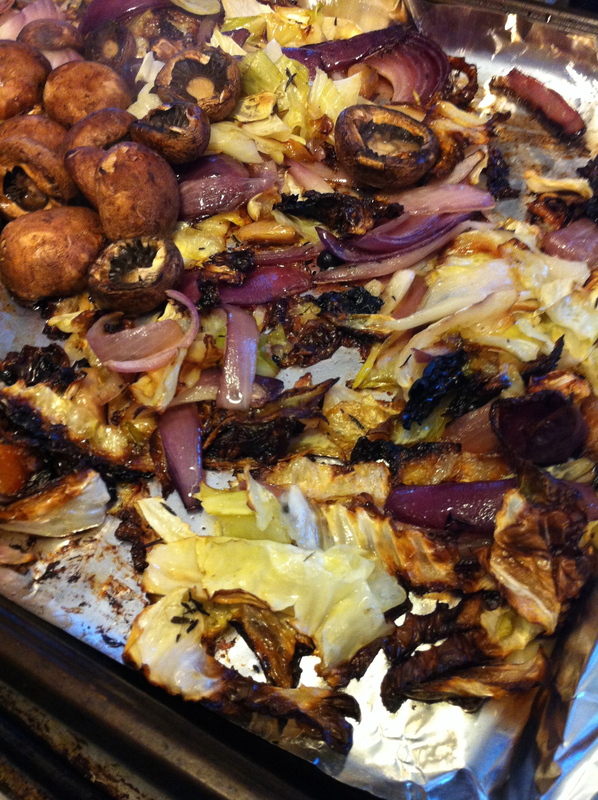 It should take about 30-40 minutes to roast all your veggies. 5- When the pans come out of the oven dust them with some salt and pepper, give them a final stir and then SERVE! Stirring everything together helps the flavors meld. Tonight I let these cool on the counter, then reheated in the same pan as the chicken – that way they got all mixed into the chicken schmaltz. I do so love this man.